TOLLerant (www.tollerant.eu) is a Marie Sklodowska-Curie Innovative Training Network (MSCA-ITN) funded by Horizon 2020 EU program and coordinated by Prof. Francesco Peri of the University of Milano Bicocca (UNIMIB). The multidisciplinary research project is focused on the study of molecular mechanisms of innate immunity, in particular Toll-like Receptors (TLR) activation and signaling and their therapeutic targeting. The network: TOLLerant consists of 8 academic and 2 industrial full partners representing 5 countries all across Europe and 3 associate partners, 2 from Europe and one from USA. The PIs expertise covers all areas of chemistry, biology, immunology, biochemistry, medicine and biophysics. In total, 13 Early Stage Researchers (ESRs) have been appointed by the TOLLerant consortium. Scientific aims: To study the role of the human TLR4 (Toll Like Receptor 4) in a number of infectious diseases including sepsis and septic shock, and inflammatory and autoimmune syndromes including neuroinflammatory and neurodegenerative diseases such as Alzheimer’s, Parkinson’s and ALS (amyotrophic lateral sclerosis). TOLLerant is then aimed at molecules capable of inhibiting the TLR4. These molecules will be hit and lead compounds to develop drugs targeting diseases in which TLR4 is involved and for which there is still no specific pharmacological treatment and efficient. This study involves interdisciplinary knowledge in the fields of pharmaceutical and organic chemistry, biochemistry, biophysics, chemistry of nanoparticles, molecular immunology and medicine. The international team of TOLLerant is made up of European researchers of high scientific profile and consolidated international image and with complementary expertise. Cultural and educational aims: to train Early Stage Researchers (ESR) by inserting them in local and EU PhD programs. Promote scientific training through schools, meetings and international conferences. Encourage the exchange of young researchers and professors in Europe. Disseminate the specific results of the project and promote and diffuse scientific culture in general through various communication channels: international journals, conferences and international meetings, internet sites of European scientific networks for a specialist audience, and events for a broader public like European Researchers’ Night. Project development. The project consists of four years from January 2015 to December 2018 and includes the realization of intermediate milestones. Meetings will be organized on a regular basis, as well as two international conferences focused on the modulation of Toll-Like Receptors for therapeutic purposes. 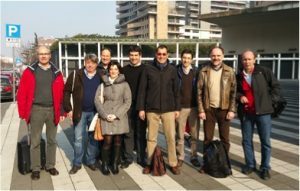 From the point of view of the training of young scientists, 13 young European researchers have been recruited by TOLLerant consortium in as European PhDs. For all the recruited ESR secondments are expected in one of the countries involved in the network.